Great photos. I hope I can visit this house someday. Love the crisp brickwork with flush vertical mortar. And how the soldier course below the windows is mirrored with dentils on the fascia. Thanks, JMD -- I appreciate that clarification. Matt, the projecting sill course gives the final bit of articulation to the forms, doesn't it. The projection doesn't appear on the elevation drawings . . . 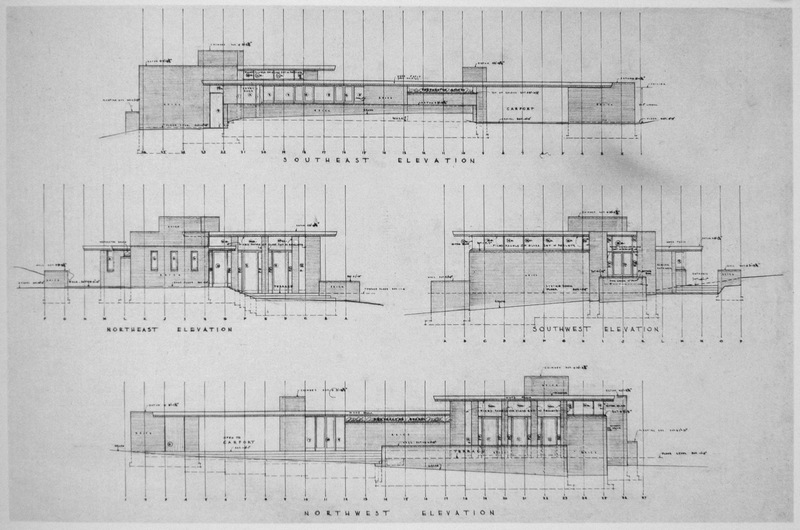 Here are the Taliesin plan and elevation drawings of the built design. 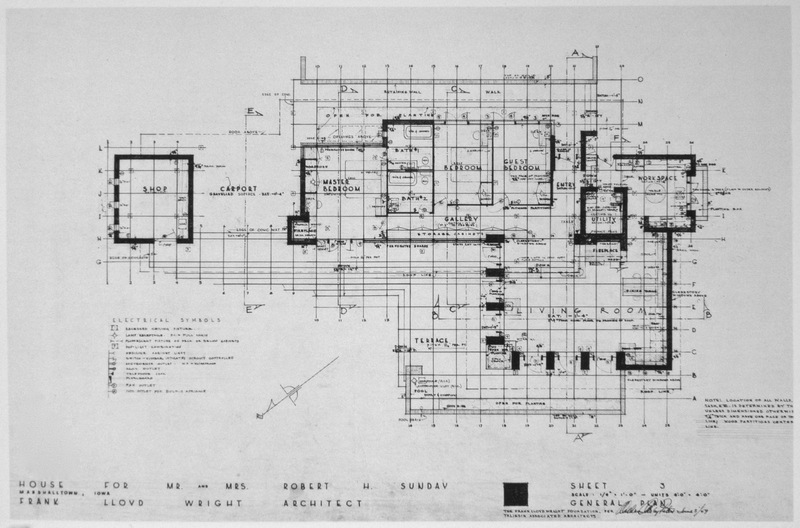 A first iteration was rendered as a Usonian Automatic, with a virtually identical layout. Thanks for the drawings. I look forward to studying them. You're spot on about that extended soldier course that gives a shadowline. The whole composition reads as very simple volumes from a distance, beautifully arranged, then as you get closer you pick out these finer levels of detail. So these masonry walls are actual masonry...that's how they did it back then? There is no rebar reinforcement? Just brick atop brick? Code probably wouldn't allow that now? The dining room addition and the diagonal garage addition are by Howe. Thank you. Storrer credits Howe with the family room and dining room additions; he says of the garage -- and "a smaller building on the same property, mimicking the main house" -- only that they are "not by Wright." He also says that Howe and John Rattenbury completed the working drawings, which apparently happened after Wright's death. The garage was designed by Bob Sunday for the second owners who demanded one. He did not want to do it but was afraid that if another architect did design it, it would not be sympathetic to the house. He angled it so it would not be mistaken as part of the original design. The three windows from the tool room were used in the new walls. Howe designed the family room and dining room and the hanging light fixture in the living room which did have an additional door on the northeast side to enlarge the living room. The drawings are signed by Wes Peters but Rattenbury and Howe did assist with the rescaling of the brick design from the Usonian Automatic. The other building on the property may be the garage or the shed which does mimic the design of the house and has been rebuilt since the original was rotted out. The living room is very nice, though when I saw it, there was a lot of clutter. This room doesn't need anything at all in it to look good. The dining room addition works well, but the family room is dull compared to the rest of the house. The house was on the market at the time, and if I had been better situated, I would have bought it. I believe somewhere around $200K or so. right angles to the existing carport wing -- it seems. construction. The inherent conundrum would have to be addressed in the literature rather than on the ground -- or perhaps with discreet signage ? A dashed line of bricks embedded in the (new) driveway would be one subtle solution . . .